The WNRCD has within our boundaries the largest city in Vermont (Burlington) and the capital (Montpelier). With over 47 communities of people calling the WNRCD home, there is an impact from developed areas on water quality that is directly linked to stormwater. The WNRCD works hand in hand with local partners to promote appropriate stormwater management practices, providing technical, financial and educational resources. 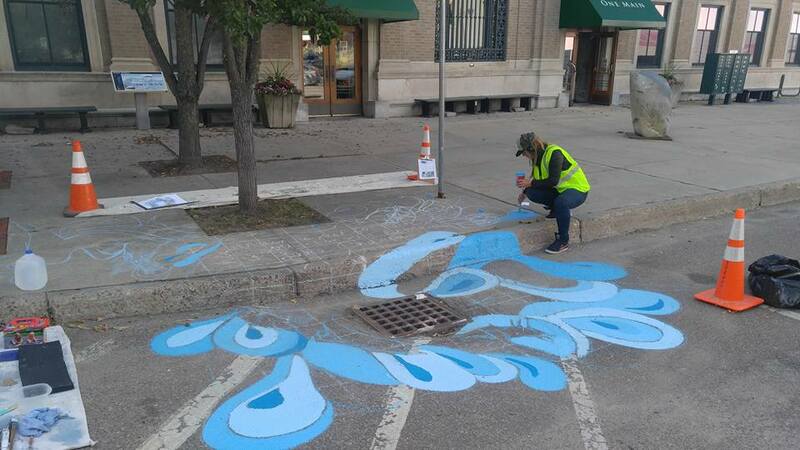 The Wi nooski NRCD is proud to manage an effort that engages citizens across nine cities and towns in watershed stewardship and stormwater action efforts. 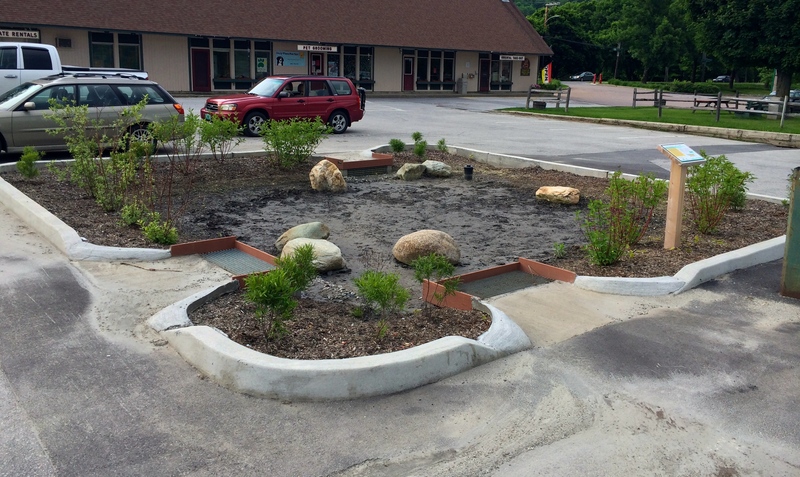 Burlington, South Burlington, Colchester, Essex, Essex Junction, Winooski, Williston, Milton and Shelburne residents are all invited to participate in place-specific and hands-on programming to reduce the harmful effects of stormwater. This regional effort includes opportunities for residents to Adopt-a-Rain Garden, test water quality in an impaired stream, participate in stream cleanups, and help in restoration efforts by planting trees. We love to meet new people and hope to see you out in the community at farmer’s markets, fairs, and events. 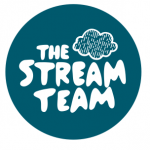 Find out more on the Stream Team website and ‘like’ us on facebook for the latest updates and a schedule of happenings in your area. 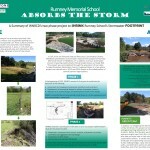 The WNRCD involves school-aged students in addressing stormwater on their school grounds through project development, implementation, and education and outreach. As schools contain large impervious areas, with vast parking lots and roof surfaces, they contribute their share of stormwater to the overall ‘system’ that can impact surrounding water-bodies. The WNRCD partners with local not-for-profits, organizations and agencies to offer a variety of education options. 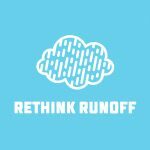 Let it Rain- Soak it for Schools– aims to connect children to stormwater through their watershed and energize them to become leaders of change. 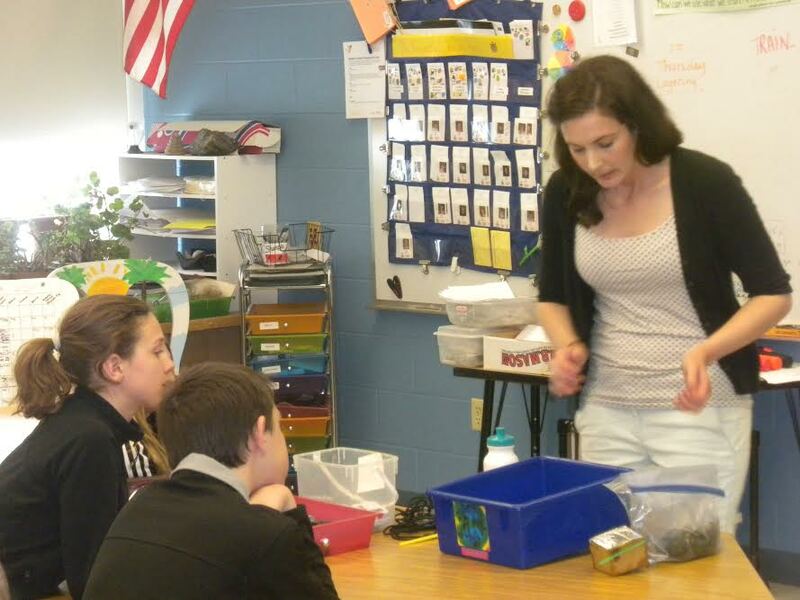 School Stormwater Mitigation– The WNRCD works with local schools in project identification, grant writing, and project implementation to reduce stormwater impacts as well as to increase student awareness and involvement. Current projects included schools within Middlesex, Essex Junction and Colchester. The WNRCD would like to thank our partners and supporters. 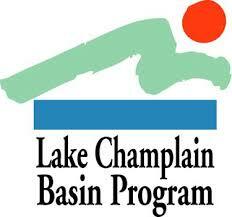 Projects funded through grants received under the Ecosystem Restoration Program, and the Lake Champlain Basin Program. 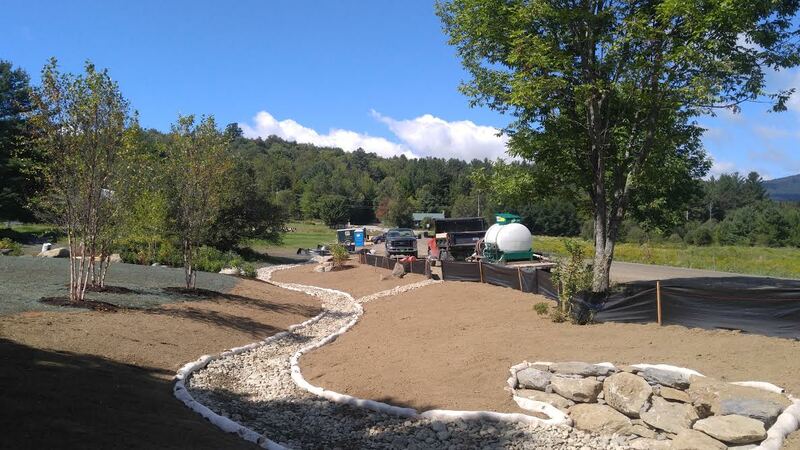 The Winooski Natural Resources Conservation District, Stone Environmental, SE Group and Canonica Farm and Forest Service partnered with the Rumney Memorial School, Middlesex VT, to develop and implement a project to better manage stormwater runoff from the school campus. Stormwater runoff from the school drained under Shady Rill Rd and through the field across the street; several large gullies had formed where the stormwater runoff dropped over the steep embankment into Shady Rill. These gullies impacted both the water quality in the brook by adding sediment and phosphorus as well as they impact the long-term stability of the embankment in the field which also housed the school’s wastewater leachfield. This project was funded with grants awarded to the Winooski Natural Resources Conservation District, on behalf of the school, by the Department of Environmental Conservation’s Ecosystem Restoration Program. 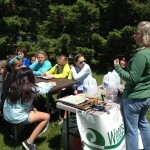 and through the WNRCD’s Soak it for Schools initiative through a grant agreement under the Lake Champlain Basin Program. 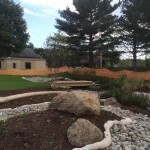 The area was planted with a variety of water-loving native plants and woody shrubs – resulting in a stormwater management practice that will both protect Shady Rill and create an improved outdoor space at the school. Coined ‘The Learning Stream’, the project took a weedy ditch and not only make it a vegetated swale that will slow the flow of water and remove sediments and phosphorus otherwise destined for Martin’s Brook, but it also connects it to the school’s outdoor learning laboratory, thereby boosting the elementary school’s curriculum to ‘real time’ without leaving the campus. 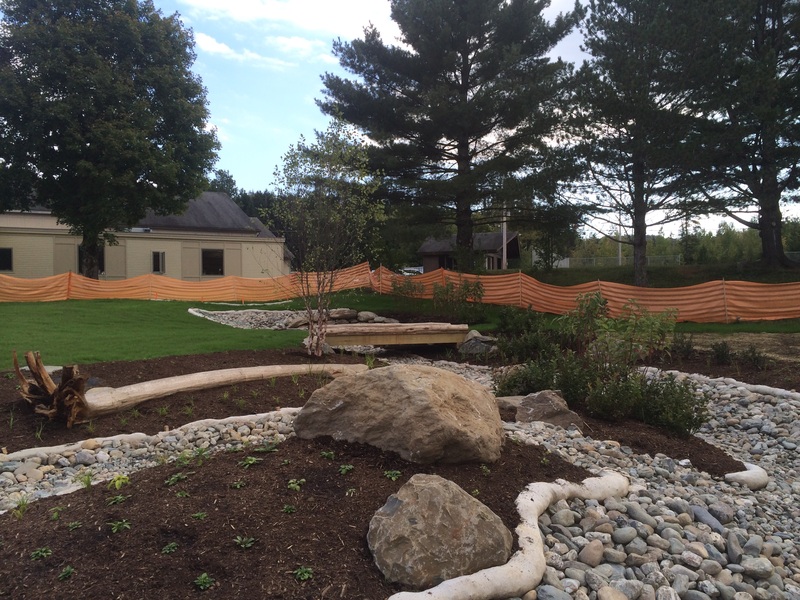 The WNRCD, District Manager Corrina Parnapy envisions partnership projects such as this as key to keeping waters clean and to help address phosphorus reduction issues of the larger watershed: Lake Champlain. The WNRCD with partner organizations assists property owners in the assessment, identification of projects and technical support for managing stormwater. 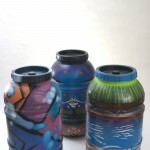 Connecting the Drops is a an art and education exhibit about water conservation featuring rain barrels adorned by talented local artists. 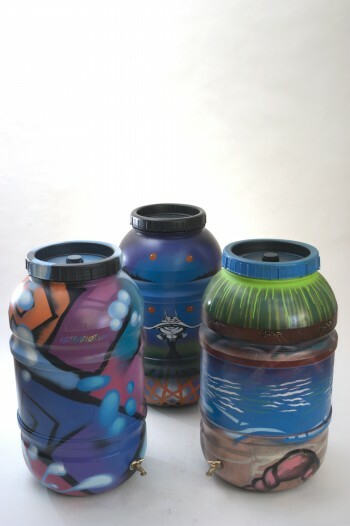 We install the barrels in Vermont towns in the summer and give people the chance to win the works of art to collect roof runoff at homes around the state. The fourth year of the Connecting the Drops Rain Barrel Exhibit has taken place. 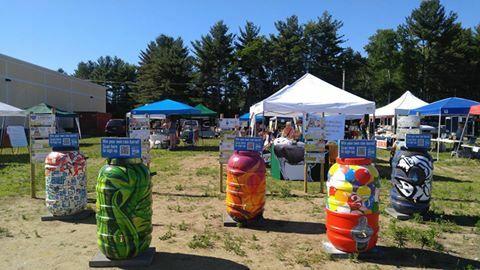 Funded by the Chittenden County Stream Team, the rain barrels were exhibited at the Hannaford Plaza in Milton from June 9th to July 7th. 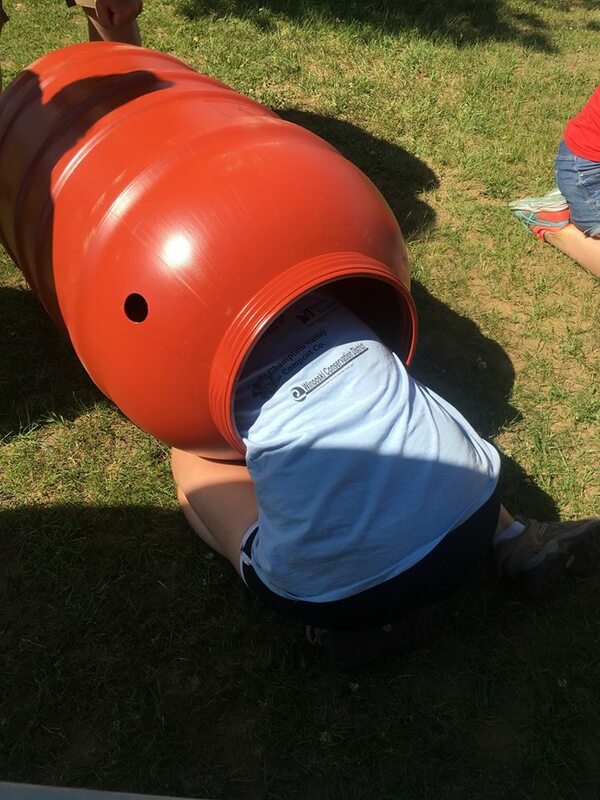 Five lucky winners took home a uniquely painted rain barrel. Interested in making your own rain barrel? email kristen@winooskinrcd.org for more information. 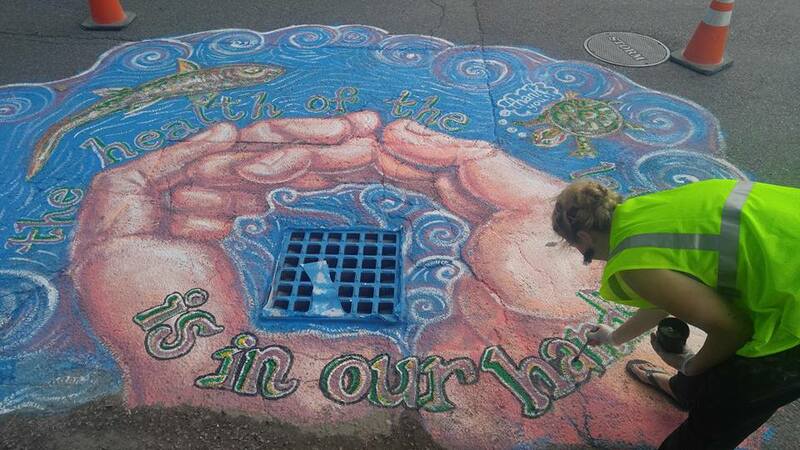 Read the Kids VT Stormwater Story – an illustrated tale about stormwater and what each of us can do to mitigate its impact. Some relics of the original 2013 Connecting the Drops project can still be seen around town. Arcana Gardens and Greenhouses in Jericho bought one of the barrels to collect water from a greenhouse roof. ECHO Lake Aquarium and Science Center installed outdoor signage explaining the rain gardens on their lakeside pavilion and Seven Days and Kids VT created a video game all about stormwater. 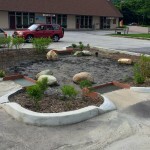 Green stormwater infrastructure and LID stormwater treatment projects mimic natural processes. 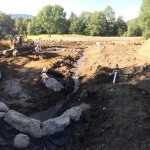 Examples of these systems include rain gardens, green roofs, and infiltration trenches just to name a few. Rather than the traditional method of moving dirty water away from hard surfaces into downstream water bodies, rainfall or snowfall is kept on site where it can slowly infiltrate into the ground and be cleansed by vegetation and soils. Slowing and infiltrating the runoff that drains from hard surfaces is one way to reduce floodwaters, if the practice is widely adopted. 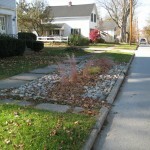 The WNRCD has partnered on the implementation of raingardens, infiltration trenches and other LID practices to mitigate stormwater. Including the parking lot in Waitsfield’s Village Square shopping center partnership project. Ahead of the Storm (AOTS) is an inter-town watershed-based initiative that participated in the 2015 Leahy Summit. AOTS promotes an “all in” approach by helping local property owners to install educational demonstration flood resiliency projects on their properties. 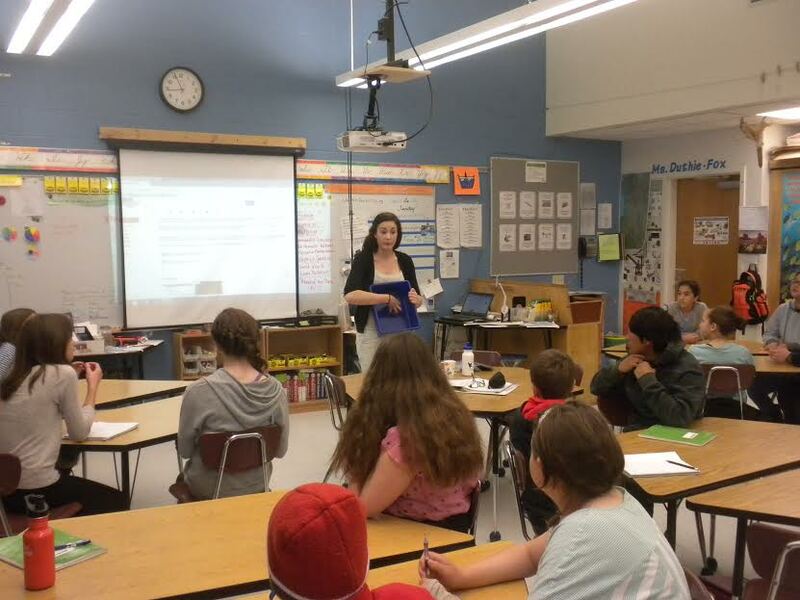 AOTS is partnering with Charlotte Central School, and Shelburne Community School to develop and implement projects within the McCabe’s Brook watershed. 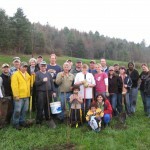 This project is a partner initiative between the community, VTDEC, municipalities, LCBP, WNRCD, Milone and McBroom and the Lewis Creek Association. The Winooski Headwaters Community Project is a locally-led effort to restore and protect the upper portion of the Winooski watershed. Its work is directed by the Conservation Commissions of Cabot, Marshfield, and Plainfield. 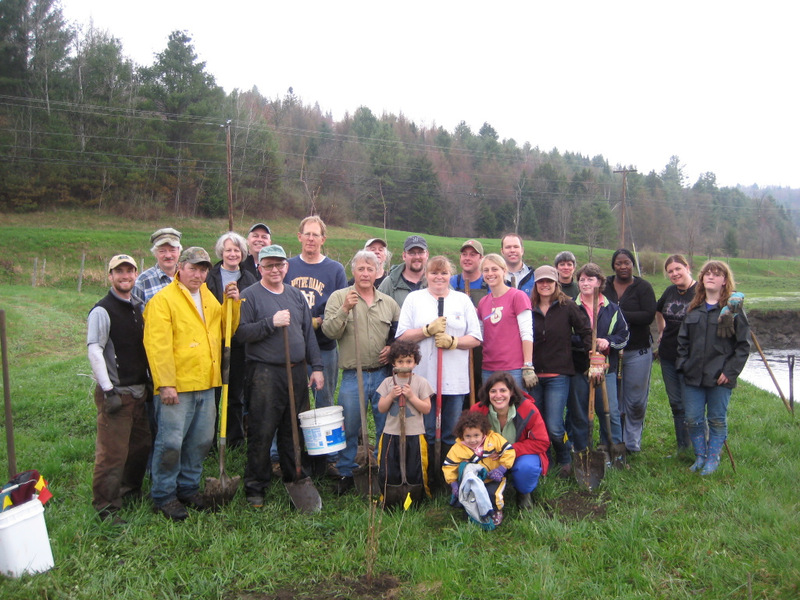 The Friends of the Winooski River and the Winooski Natural Resources Conservation District provide facilitation and staff support. Other partners include local and state government, local businesses, non-profit organizations, and citizens. The partners have emphasized education, cooperation, and community involvement in all their projects. The group works directly with the local schools and community to implement stormwater mitigation.